Steel Dragon Tools has over a decade of experience refurbishing pipe threading machines and accessories. The RIDGID® 535 is a prime candidate for reconditioning and can be found quite often in the Steel Dragon Tools shop. The 535 debuted on the market in 1957 and has been running in one form or another for over 50 years. Despite the years of experience, the technicians in the Steel Dragon Tools shop are always learning something new. In this case, the technicians pointed out that an 815A die head is not compatible on a 535 Version 1 machines that is equipped with a 340 Reamer. This is a very specific issue that won’t affect most customers who use a 535 Version 1 machine. While the 815A die head is compatible with the 535, most customers will use the 811A die head. The 811A die head is much more common and is included with all reconditioned RIDGID® 535 packages offered by Steel Dragon Tools. For customers who have a 535 Version 1 machine and want to use an 815A die head, be sure to check which reamer in on the machine. Over the years, as the 535 machine changed from Version 1 to Version 2 to Version 3, the attachments changed slightly as well. The 811 die head became the 811A die head and allowed for automatic oiling. The 815A die head was later introduced with an automatic opening feature that opens the die head when threading is complete. The 340 reamer was updated slightly to become the 341 reamer. The 341 reamer is standard on later model 535 machines but will also fit the original 535 design. The difference between the 340 and 341 is nominal. The only thing that has changed over 50 years is the shape of the reamer arm. The 341 reamer has a shallow arm while the 340 reamer has a much more pronounced arm. It is the arm of the 340 reamer that will contact the 815A die head trigger, preventing the reamer from raising or lowering on the machine. This is only an issue when using an 815A die head on a RIDGID® 535 Version 1 machine that is equipped with a 340 reamer. To learn more about Steel Dragon Tools reconditioned RIDGID® 535 machines, click here. To learn about the difference between 811 and 815 die heads, click here. Steel Dragon Tools offers two models of pipe threading machines that thread, cut and ream up to 4-inch pipe, rod, and bolts. The Steel Dragon Tools 1224 and the Steel Dragon Tools 6790 pipe threading machines both thread, cut, and ream a wide range of black, galvanized, and plastic-coated pipe, as well as stainless steel, IMC, and heavy-wall conduit. Both machines are equipped with a foot switch, reversible motor, and come with die heads and dies, and an optional stand. The Steel Dragon Tools 6790 has a threading range of 1/2 in. to 4 in. The Steel Dragon Tools 1224 has a threading range of 1/4 in. to 4 in. 1: The Steel Dragon Tools 1224 is compatible with universal RIDGID® brand dies, die heads, and jaw inserts. RIDGID® or Steel Dragon Tools 711 and 714 die heads are interchangeable between the Steel Dragon Tools 1224 and the RIDGID® 1224 pipe threading machines. All universal dies will fit both die heads and machines. The Steel Dragon Tools 1224 comes with a Steel Dragon Tools 711 and Steel Dragon Tools 714 die head. 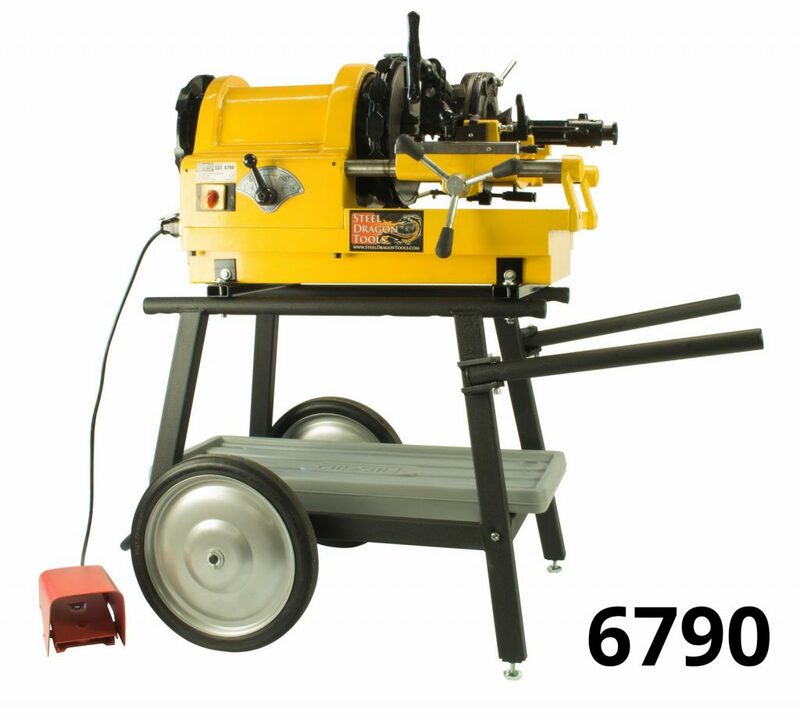 The Steel Dragon Tools 6790 pipe threading machine also includes two die heads but the dies and die heads for the 6790 will only fit other compatible Steel Dragon Tools pipe threaders. 2: The Steel Dragon Tools 1224 pipe threading machine is adjustable to thread both NPT (National Pipe Thread Tape) and NPSM (National Pipe Straight Mechanical) threads. The 6790 only threads NPT. The ability of the 1224 to thread both NPT and NPSM makes it an easy choice for electrical contractors who may have to do both. 3: The Steel Dragon Tools 6790 pipe threading machine has a two-speed transmission and 750-watt induction motor. 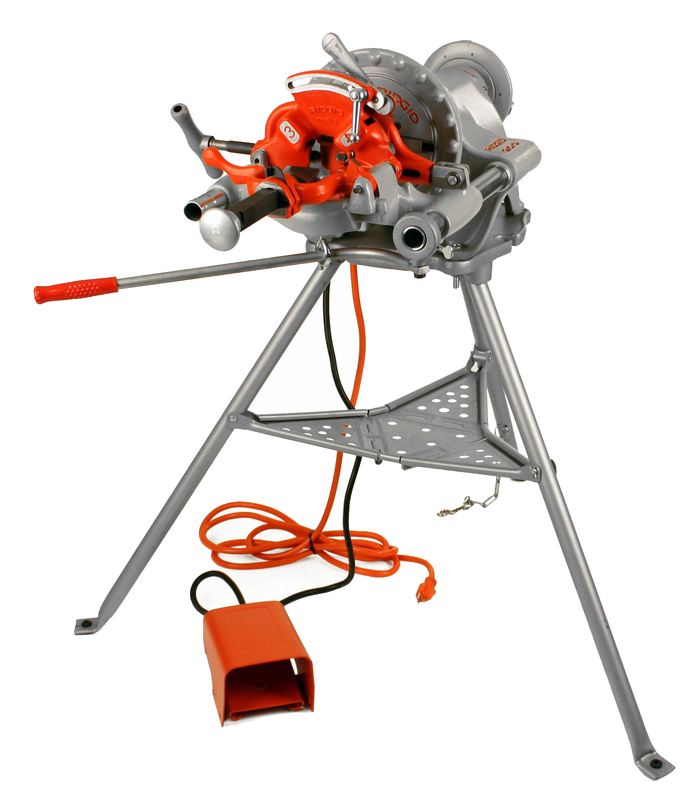 The Steel Dragon Tools 1224 has a three-speed transmission and a 1,500-watt motor. The 1224 will handle 4-inch pipe threading much easier than the 6790 due to a larger motor motor and more-powerful transmission. 4: Price. The Steel Dragon Tools 1224 is considerably more expensive than the Steel Dragon Tools 6790. Both machines, however, cost significantly less than other machines built but name-brand competitors. Click here to learn more about the importance of pipe threading oil. Die heads for most Steel Dragon Tools and RIDGID® power pipe threading machines will either be automatic or non-automatic. Automatic refers the die head’s ability to automatically oil the pipe during the pipe threading process. These die heads will have a through-head oiling system. Automatic die heads will also have an “A” designation in their name like 811A or 815A. The die head will connect to the pipe threading machine’s oil reservoir, if the machine has one (Steel Dragon Tools and RIDGID® 300 Power Drives do not have an oil reservoir and require a separate, manually operated oiler – like the Steel Dragon Tools 418 Oiler). A pump in the pipe threading machine will push pipe threading oil to the die head where it will be distributed over the pipe during the pipe threading process. The automatic-style die head is now used across the industry. 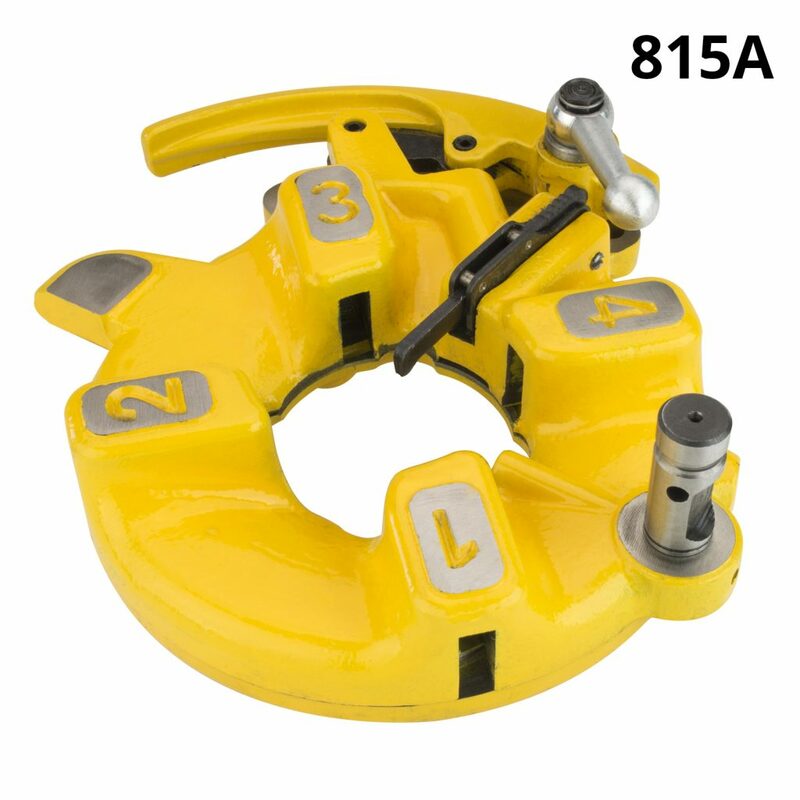 Non-automatic 811 and 815 die heads are typically not sold as new but can be found used or reconditioned. Steel Dragon Tools buys and reconditions used and broken pipe threading machines and accessories, including RIDGID® 811, 811A, 815, and 815A die heads. Click here for more information on selling used equipment to Steel Dragon Tools. Click here to learn more about the difference between 811 and 815 die heads. Steel Dragon Tools manufactures high speed steel and alloy dies to meet or exceed industry specifications. These dies are compatible with Steel Dragon Tools pipe threading machines and can be used in compatible dies heads with other machine brands. Dies are an essential part of the pipe threading process. 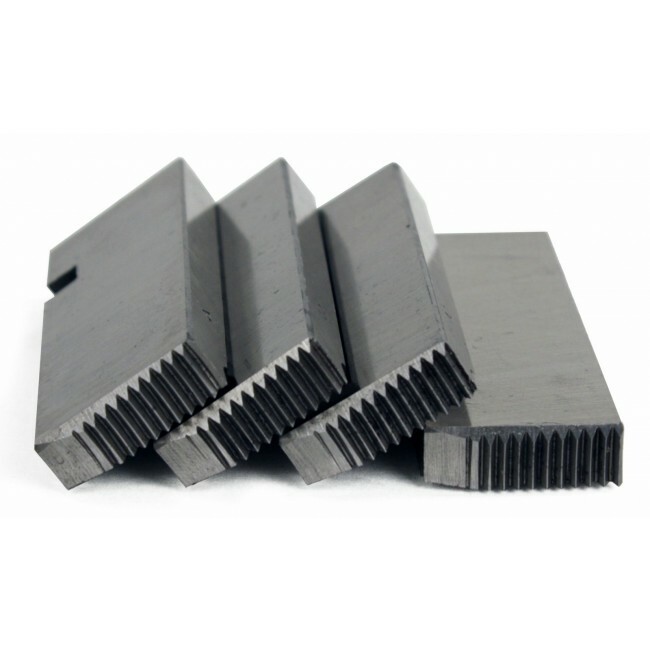 Sharp, well-made dies will ensure consistent, useable threads. Dies with dull or chipped teeth will result in poorly threaded pipe that will not seal properly. Replacing dies as they wear or chip is a necessity but it doesn’t have to break the bank. Steel Dragon Tools dies are compatible with the specified Steel Dragon Tools pipe threaders and will fit certain other brands. Steel Dragon Tools dies will match the quality of comparable dies but for a fraction of the price. Steel Dragon Tools can offer dies for far less since there is no middle man. Steel Dragon Tools manufacturers the dies and then sells them directly to the customer. Buy an extra set of dies and never worry about chipping a tooth while on the job site. Steel Dragon Tools manufactures dies for powered and manual pipe threading machines. Many of these dies can be used in compatible die heads from Wheeler Rex® and RIDGID® machines. For more information on the Steel Dragon Tools dies, click here. For more information on Steel Dragon Tools pipe threading machines, click here. For more information about Steel Dragon Tools please call contact Customer Service at 734-224-7112 or by e-mail here. The full line of Steel Dragon Tools are available for purchase from Craig’s Affordable Tools or Toolz Unlimited. Steel Dragon Tools is now offering repair services for used or broken pipe threading machines. Steel Dragon Tools will inspect, repair, and refurbish pipe threading machines manufactured by RIDGID®, Wheeler-REX®, Steel Dragon Tools®, ROTHENBERGER®, and Collins. Steel Dragon Tools has ten years of experience refurbishing pipe threading machines and is now offering repair service on a wide range of equipment. Steel Dragon Tools technicians will troubleshoot, repair, and replace parts as needed to make used or broken pipe threading machines run like new. Steel Dragon Tools technicians use genuine OEM parts along with aftermarket parts to bring the tools back to OEM specifications. Contact Steel Dragon Tools at 734-224-7112 or e-mail here. Include the make and model of the machine and any issues or problems with the machine. Steel Dragon Tools will reply with an estimated repair cost. Steel Dragon Tools can arrange for shipping. Shipping charges will be added to the final bill. Customers may also arrange shipping at their own expense. Please have all paperwork submitted prior to the machine’s arrival at the Steel Dragon Tools facility. Customers will be responsible for the inbound and outbound shipping charges as well as the inspection fee. The Steel Dragon Tools repair rate is $80 per hour plus cost of parts. If the estimated cost of the repair exceeds the value of the machine, Steel Dragon Tools will offer to purchase the machine. The inspection cost will be deducted from the agreed purchase price. The inbound freight charges will be removed from the balance if Steel Dragon Tools arranged the shipping. The remaining credited balance can be used to purchase a refurbished pipe threading machine or a check will be mailed out. Steel Dragon Tools offers a 30-day warranty on all parts. Contact Steel Dragon Tools at 734-224-7112 or e-mail here. RIDGID® is a trademark of RIDGID, Inc and is used only for product identification purposes. Wheeler-Rex Inc.® is a trademark of Wheeler Manufacturing, a division of Rex International, and is used for product identification purposes only. ROTHENBERGER® is a trademark of Rothenberger and is used only for product identification purposes. Steel Dragon Tools® products are backed by a one (1) year warranty against manufacturer defect. Steel Dragon Tools manufactures a wide-range of die heads that will fit a variety of industry-standard pipe threaders, as well as the Steel Dragon Tools line machines. Steel Dragon Tools die heads will fit popular RIDGID® pipe threading machines, including Model 300, 535, and 1224 machines. 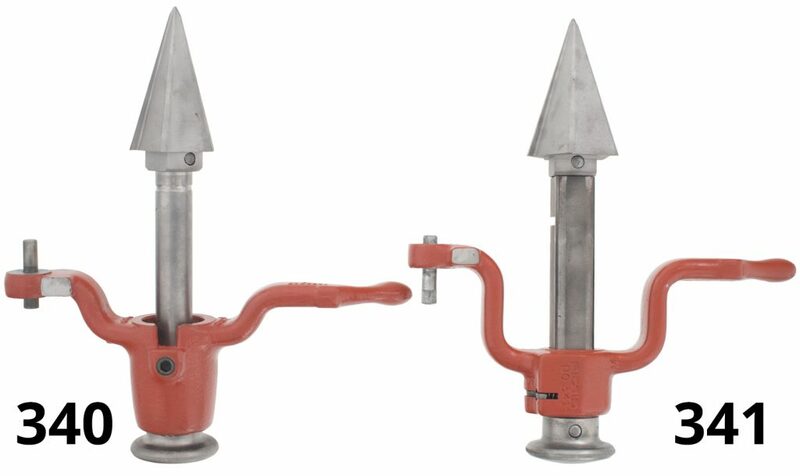 Steel Dragon Tools also manufacturers die heads for RIDGID® 11R and 12R Pipe Threaders. 11R and 12R die heads can be used manually with a ratchet handle or in conjunction with a power drive like the RIDGID® 41935 Model 700. Steel Dragon Tools also manufacturers die heads that will fit certain Wheeler-Rex® pipe threading machines. The Steel Dragon Tools 70131 die head will the Wheeler-Rex® 6790 Pipe Threading Machine. All Steel Dragon Tools die heads will also fit the related Steel Dragon Tools pipe threading machines. For use on RIDGID® Model 1215, 1233, 300, 300 Compact, 535, 535A and 1822 Machines. For use on Steel Dragon Tools Model 300 and 300C Machines. For use on RIDGID® Model 300, 300A, 500, 500A, 535, 535A, 800, 801, 802, and 1822 Machines. For use on RIDGID® Model 1224 Machines. 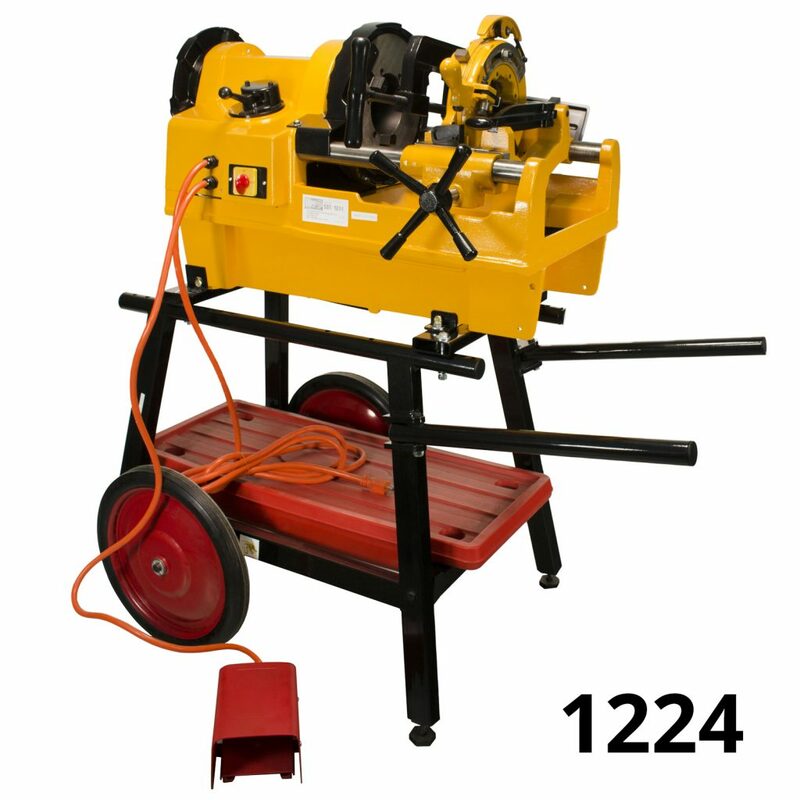 For use on Steel Dragon Tools Model 1224 Machines. Steel Dragon Tools manufacturers a full line of 12R die heads. All Steel Dragon Tools die heads thread in the right-hand direction and come with one set of corresponding dies. 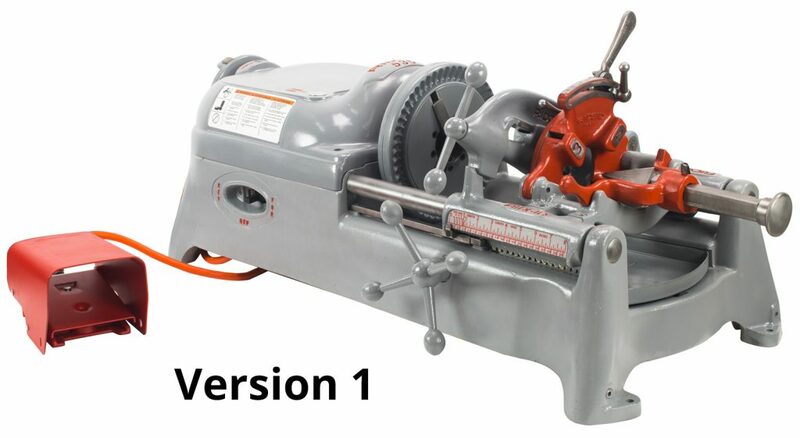 For use with RIDGID® 12R Manual Pipe Threaders and RIDGID® Model 700 Power Drive. For use with Steel Dragon Tools 12R Manual Pipe Threaders and Steel Dragon Tools Model 700 Power Drive. Steel Dragon Tools manufacturers a full line of 11R die heads. All Steel Dragon Tools die heads thread in the right-hand direction and come with one set of corresponding dies. For use with RIDGID® 12R Manual Pipe Threaders, RIDGID® Model 600 Power Drive and 700 Power Drive (with adapters). For use with Steel Dragon Tools 12R Manual Pipe Threaders, Steel Dragon Tools Model 600 Power drive and Model 700 Power Drive (with adapters). Steel Dragon Tools 70131 die head will fit the Wheeler-Rex® 7991 Pipe Threading Machine. 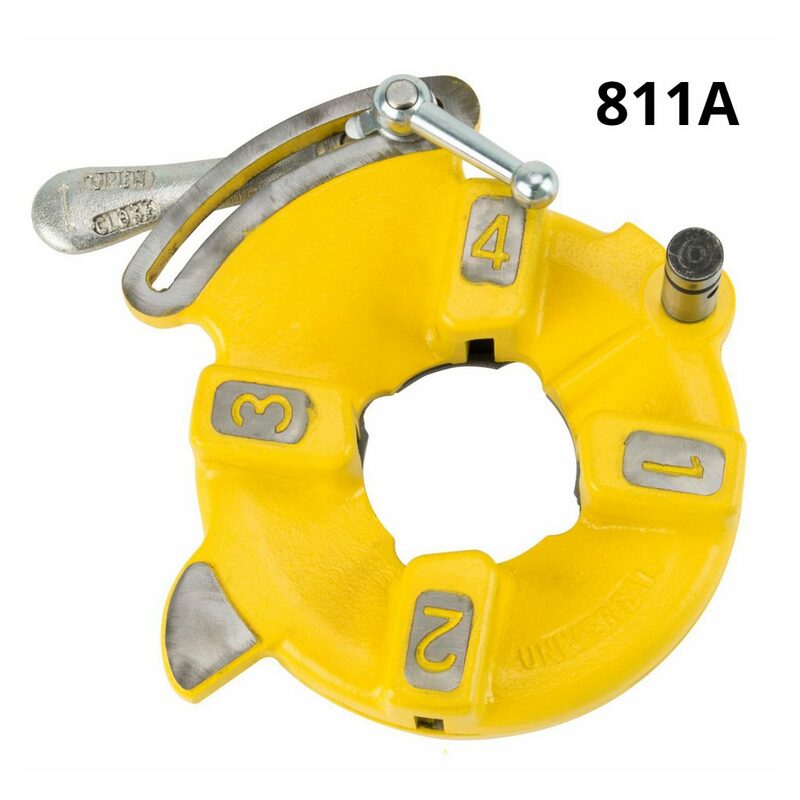 For use on Wheeler-Rex® Model 7991 Machines. For use on Steel Dragon Tools Model 7991 Machines. For more information on the Steel Dragon Tools die heads, click here. For more information on Steel Dragon Tools pipe threading machines, click here. These products are designed and manufactured by Steel Dragon Tools. Wheeler-Rex® is a trademark of Wheeler Manufacturing, a division of Rex International, and is used for product identification purposes only. RIDGID® Marks are trademarks of RIDGID, Inc and are used for product identification purposes only.